WHERE LAKE BAIKAL IS LOCATED? The Baikal lake is located in southern Siberia, not far from the border between Russia and Mongolia, 5 hours ahead of Moscow. In terms of regions and Russian territories, Lake Baikal is split among Irkutsk Oblast (whose capital is Irkutsk) for the western shore and Republic of Buryatia (whose capital is Ulan-Ude) for the eastern shore. To give an idea of "how far north Baikal Lake is", we can say that the southern part lies more or less at the latitude of Berlin, while the northernmost shores extends to the same latitude of Copenhagen. The altitude of Baikal lake is 455 meters above sea level and it extends for 636 kilometers of length and 79 of width, while, with a maximum depth of 1642 meters, Lake Baikal is the deepest lake in the world and the biggest fresh water basin on the planet: Baikal lake contains in fact over 20% of whole world's fresh water excluding polar ice caps. WHAT TO SEE ON LAKE BAIKAL? Lake Baikal ice. The water of Lake Baikal is one of the most clear and pure in the world, therefore also the ice has rather unique characteristics of transparency and clarity. As we will see later in this travelogue, such feature is due to a certain number of factors, however the biochemical processes by various micro-organisms that metabolize impurities, causing them to fall to the bottom of the lake, play a fundamental role. It is estimated that the rocky basement under Lake Baikal is covered by 8500 meters of sediments, which when added to the depth of the lake, reveal a pit almost as deep as that of the Marianas Trench. During the second half of the winter, the entire Lake Baikal is covered by a layer of ice between 50 and 140 centimeters thick, making possible to travel throughout the whole lake by various vehicles (hovercraft, normal 4x4 cars, bikes, motorcycles, skis or skates) letting to discover the supernatural landscapes created by an extreme climate. Due to scarce precipitations and snow quickly blown away, many areas of Lake Baikal have completely clean ice without any snow on top. The ice will appear virtually black because the tremendous transparency makes possible to look right into the abyss, where light does not arrive. Instead, infinite cracks and veins on the ice, give the sensation of observing the vascular system of a living creature. Closer to the coast, the ice may appear blue, green or totally transparent, letting the stones on the bottom to be clearly seen, as you would see them if walking on glass. Taiga (or boreal forest). The taiga, also known as boreal forest, dominates mountains and territories around Lake Baikal and consists predominantly of evergreen cedars, larches and birches. This ecosystem hosts a large number of animals, some of which are active only in summer, such as brown bears, moose, reindeer, roe deer, wolves, foxes, sables, marmots and various species of birds. The forest can be visited by various ways depending on the season. Biodiversity of Lake Baikal. It is estimated that Lake Baikal hosts over 2500 species of animals and plants and that several of these are endemic and not present in other parts of the world. One of the most characteristic endemic species of Lake Baikal is certainly the nerpa or Lake Baikal seal (Pusa sibirica), the only freshwater seal on the planet, which population counts roughly 75,000 individuals. The waters of the lake are also populated by giant sponges, many species of crustaceans and various fish including the omul. Olchon island and Shaman rock. Olchon island is one of the largest lake islands in the world and is located not far from the southwestern coast of Lake Baikal. The island is home to a native population, the Buryats (ethnic minority of Siberia) who practice Shamanism and Lamaism (Tibetan Buddhism). The Shaman Rock, besides being an important sacred site, offers also fantastic views onto Lake Baikal in a semi-arid environment due to the scarcity of precipitations. Siberia's traditional villages. Along the shores of Lake Baikal there are several remote villages with log houses typical of traditional Siberian architecture, which sees the walls built using whole logs and decorated by beautiful inlaid wood. In these villages visitors can learn more about local way of life, may observe fishermen at work or hike among unspoilt taiga forest. Hot springs. The area around Lake Baikal has considerable geothermal activity: near Khakusy and not far from Severobaikalsk there are natural spas immersed in a beautiful landscape, where visitors can enjoy the warmth of these healing waters, excellent to cure skin and osteoarthritis. Trans-Siberian Railway and BAM railway line. A trip to Lake Baikal is an excellent opportunity to travel on the Trans-Siberian railway, which runs along the southern part of the lake connecting Irkutsk with Ulan-Ude, or on the BAM railway line (Baikal-Amur Mainline) which passes instead through Severobajkalsk along the northwestern shore of the lake. By optimizing the itinerary, visitors can travel on both these railway lines. Irkutsk. Many trips to Lake Baikal will start right in Irkutsk: so let's take advantage of the time available before leaving for the lake, to visit this important city of southern Siberia, where visitors can still find traditional wooden buildings or cathedrals with frescoes and paintings that you wouldn't expect to see in these regions. HOW TO GET TO BAIKAL LAKE? The main gateway to Lake Baikal is the city of Irkutsk, served by numerous direct flights onto Moscow and onto major Siberian cities. A growing number of international destinations are available as well. For those arriving from Europe, the connection in Moscow is convenient and fast (better, however, to ensure at least 3 hours between flights, as it will be necessary to change the terminal and the immigration procedures may be a bit long especially on rush hours). For those arriving from North America or South-Eastern Asia, Beijing, Seoul, Tokyo or Vladivostok are probably be the most convenient hubs to get to Irkutsk. Another way to get to Irkutsk is by Trans-Siberian trains from either Moscow or Vladivostok (3-4 days of travel) or from any other Siberian city located along this railway line. From Irkutsk it is only 1 or 2 hours by road to get to the southwestern shores of Lake Baikal and it is for this reason that most of the organized tours to the lake leave just from this city. 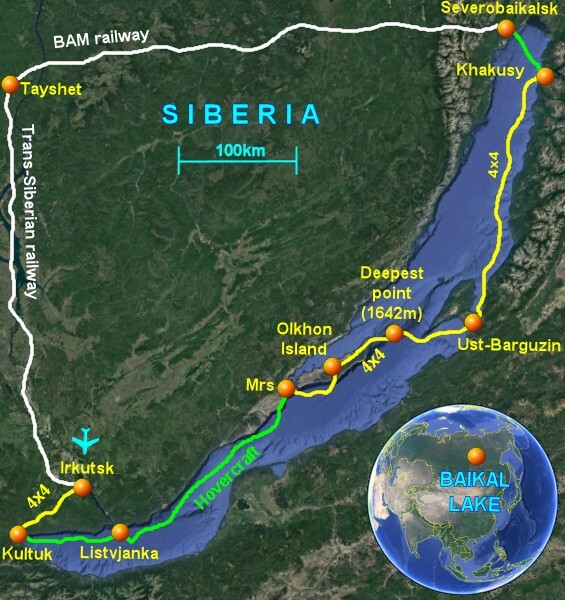 Other access points to Lake Baikal are Severobaikalsk to the north, where visitors can arrive by train (Baikal-Amur Mainline, known as BAM) or Ulan-Ude for the eastern shore, which can be reached by plane or Trans-Siberian train as well. HOW TO MOVE AROUND ON LAKE BAIKAL? The way to move around on Lake Baikal depends on season and conditions of the ice. During the second half of the winter, the ice covers the entire lake and its thickness makes possible to move around safely on it by hovercraft, cars and any other ground vehicle. In summer, without ice, the most suitable ways to move around on Lake Baikal are obviously ferries, small cruise boats, motorboats and, once again, the hovercraft. Mid-seasons are more problematic as ice is not safe enough to travel on, but it is still too much dense to be crossed by normal boats. In this case, small ships with reinforced hull can be used to safely sail in such an environment. IS IT SAFE TO GO TO LAKE BAIKAL ON MY OWN, OR IS IT BETTER TO GO WITH A LOCAL OPERATOR? The extreme environmental characteristics, especially in winter, and the logistic needed in any season, suggests that contacting a local operator which can provide an experienced guide, is the best solution. On Lake Baikal it will be necessary to travel around a lot to see all the things: now on hovercraft, now by car, now by boat, now by train: in the most remote villages there are no hotels, but just accommodation provided by local families, and organizing everything without speaking Russian, can be long, complicated and you will risk to miss lot of beautiful things. The tour presented in this travelogue has been organized by BAIKALNATURE, who provides lot of itineraries in all seasons and convenient group departures. WHICH IS THE BEST SEASON TO GO TO LAKE BAIKAL? Lake Baikal in winter. The second half of winter, more precisely between mid-February and mid-March, is the best (and indeed the only) time for a trip on the frozen Lake Baikal. During this period visitors can cross the whole lake on its surface by a variety of vehicles and have lot of fun discovering all the types of ice dominating this crystal world. Winter is instead the worst season to see wildlife, as some animals are in hibernation, while others are more elusive (the fresh water seal dives quickly into the breathing holes as soon as hears the noise of any vehicle). Lake Baikal in spring. When the ice thaw in May, Lake Baikal is extremely picturesque, as the ice blocks create an intricate labyrinth among crystal clear waters. This is a good time to observe fresh water seals resting on flat icebergs and other animals will also become more and more active. The taiga will be green, with lot of flowers spread among the valleys. Lake Baikal in summer. During the summer, between June and August, Lake Baikal is ice-free and has a beautiful, very intense blue color. This period is ideal for cruises aboard yachts and small ships and is the best time for observing fresh water seals and other taiga's wildlife. The main drawbacks of this season, especially between July and August, may be increasing mosquitoes. Lake Baikal in autumn. The end of summer, and in particular the first half of September, is the best time to observe the nature changing its colors, with larch, birch and other trees showing infinite shades of yellow and orange. The animals are still active and the mosquitoes begin to disappear, while the cobalt blue waters are still perfectly navigable. Lake Baikal in December/January. Between December and January the ice of Lake Baikal is still not safe to be crossed with surface vehicles, but it is already too compact even for boats with reinforced hull. This is perhaps the least suitable time to go to Lake Baikal, however it is the best time to experience extremely low temperatures, which sometimes fall below -40 degrees. HOW IS THE WEATHER ON LAKE BAIKAL? HOW TO DRESS? Lake Baikal has a local microclimate quite different from the climate of the rest of Siberia, especially regarding the precipitations, which are well below the average in terms of both rain and snow. The weather on Lake Baikal is often sunny, particularly during the long winter, but the wind can occasionally be very violent. The average temperature during the second half of winter, when traveling to Lake Baikal to enjoy the clear ice, is generally a few degrees below freezing point, with extremes ranging between -30 and +5 centigrades. The extreme cold usually happens before the tourist season, from December to mid-February, when temperatures can drop below -40 degrees centigrades. The temperature in summer is usually mild, with daytime maximum reaching almost +25 degrees and the minimum around +10/15 degrees (extremes that can exceed +30 degrees are always possible). Be careful however once again for the winds, which can become violent without warnings and may generate waves in the lake up to 5 meters high. Due to the wide range of temperatures that can be encountered even within a few hours or days, layered clothing is recommended, avoiding cotton and preferring wool or synthetic. A wind-stopper outer layer, gloves and a hat, are useful in all seasons. During the winter it is advisable to wear a pair of padded trousers and a good-weight wind jacket or expedition parka (with at least 600 grams filling) providing also good protection for the neck. WHERE TO STAY ON LAKE BAIKAL? The main towns located along the shores of Lake Baikal, like Listvjanca, Mrs or Chuzir on the island of Olchon, offer a good variety of accommodation facilities, usually in typical Siberian architecture, including guesthouses and family stay. In the more remote villages like Ust-Barguzin, the only possible option is often just a family stay, while in major cities like Ulan-Ude, Irkutsk and Severobajkalsk, there are normal hotels with all western standards. Other options in the middle of nowhere are obviously cabins or refuges (such as in Khakusy) or tents. Irkutsk is the main gateway to Lake Baikal: we take advantage of a one-day stop to discover the attractions of this interesting city. The crossing of Lake Baikal begins from the southernmost port of entry, moving from Kultuk to Listvjanca aboard an hovercraft. Journey aboard an hovercraft from Listvjanca to Mrs to discover various types of ice that cover Lake Baikal, among the unspoilt landscapes of Siberia. Olkhon Island is one of the largest lake islands in the world: we admire the scenic beauty of this sub-arctic desert and come into contact with local Buryats traditions. The expedition to Lake Baikal continues crossing the lake longitudinally in 4x4 cars, with an overnight stay in a tent directly on clear ice. The eastern shore of Baikal lake hosts a traditional village with log houses, nestled in the boundless Siberian taiga. Khakusy is a remote resort without any resident population and with basic facilities: we enjoy the warm and healing water of the hot springs among an unspoilt taiga forest. Severobaikalsk is located along the north-western shore of Lake Baikal: we visit the city and the nearby Goudzhekit hot springs, where visitors can also practice different winter sports. We return to Irkutsk by train, traveling on both BAM and Trans-Siberian railways, aboard a consist equipped with cabins for 4 passengers and bunks.